See department information about BFS Mail Services. Our customers are our priority. The Campus Mailbox initiative presents us with the opportunity to continue meeting existing as well as projected customer demand with current resources. Easy to use combination locks. *Parcel lockers for incoming packages. In Mail Services, our mission is to provide the most efficient and highest quality delivery, collection and processing of University mail. Our customers are our priority. While campus is growing (new buildings, new departments, new projects, and new satellite locations) we currently have less than half of the staffing we had at the turn of the century. Our Campus Mailbox Initiative presents an opportunity to continue meeting the growing demand with existing resources. For our customers, this initiative will offer: conveniently located and secure mailboxes with combination locks, outgoing mail slots and parcel lockers. In addition to improved service, the new process will reduce our carbon footprint and bring us into better alignment with the campus sustainability goals. Working with Facilities, Design and Construction, the Fire Marshall and location representatives, we have identified mailbox locations throughout campus. A soft launch and ribbon cutting ceremony took place with the installation and implementation of mailboxes at the Telemedicine Building in August of 2012. We later conducted additional testing at the Campus Services Complex with great success. The next step in this initiative was the roll out of boxes at three additional locations, Basic Science Building, CSB and Medical Teaching Facility. 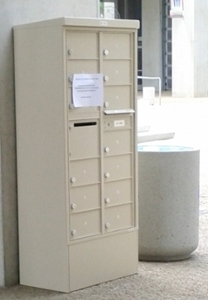 Since then we have begun to slowly phase in mailboxes in other locations on campus. The second phase of this project will be the implementation of an electronic tracking system that will generate email notifications and maintain records of incoming mail and deliveries. We look forward to piloting this portion of the project in Fall 2013. Since beginning implementation, we have received and responded to customer feedback. Customers get to experience the security of having their mail in a locked box rather than laying in a basket in an unattended area. Customers like that idea of being able to receive mail whether their office is open or not. One customer was concerned that they would not receive their larger packages, but we assured her we will continue to provide direct delivery service for oversized packages. Aside from the security and convenience benefits for you and the labor and fuel savings for us, this initiative also addresses safety concerns related to our staff having to enter potentially hazardous or sensitive areas. The campus community benefits from our reduced carbon footprint and increased capacity to support special requests and mailing projects. Any change requires adjustments. We welcome your comments, questions and concerns. We want this to be as positive an experience as we can make it. We encourage you to direct comments and questions to mailservices@ucsd.edu.